11-28 February Tickets available here. Part of the reason for this lies in the treatment of Pinball when it was first written and released in 1981, much derided as “female chauvinist piggery” (Brian Hoad in The Bulletin) incredible when you realise The Removalists, a play many (including myself) consider very blatantly male chauvinistic was being heralded as a success for the previous ten years, and for several subsequent decades. This is even more remarkable, when you realise Alison Lyssa took her specifically misogynistic judge character from real court transcripts, despite the accusations of a distorted inflammatory prose. The messages being sent were loud and clear; a masculine misogynistic voice is to be understood and respected and a female representation of misogyny is to be ignored, then buried – the girls at my high school all heard it loud and clear. This is all even more remarkable when you realise the treatment of Pinball is precisely the subject of the play. Duck Duck Goose found Pinball, and brought it back to the stage for the Gay and Lesbian Mardi Gras, in an unapologetic celebration of Australian Queer theatre. It’s a truly remarkable play about a young lesbian woman, Theenie (Karoline O’Sullivan) forced into a custody battle for her son, when she and her ex husband Sylvester (Leo Domingan) can’t convince the other members of their families to live and let live. The child, poignantly invisible and voiceless in the play, is bounced back and forth through the selfishly motivated theories and ideas of all parties as more and more people try to get onto the bandwagon, using Theenie and her male child Alabaster, as a political football. Lyssa draws on many types and styles of theatre obviously inspired by the brilliant (and aforementioned) Caryl Churchill and even in the twist at the end (which I will not spoil) by Shakespeare and The merchant of Venice. Threaded throughout the plays narrative is a very clever reference to biblical ideals and the wisdom of Solomon. It was a stroke of amazing brilliance to use modern legal jargon, “splitting the baby” against itself in drawing the constant parallel between the scriptures as the basis of our modern legal system. Lyssa’s play is as much about the way ancient words have been coded into our modern patois and the power they still wield as it is about what our society deems a radical threat. It is the cleverness and wit in Lyssa’s language that makes it relevant and emblematic of an Australian way of life that both acknowledges its roots, even as it pretends to rise above them, but which clings to something ancient mistaking it for stability. If the responsibility of enlightenment is to work toward our own individual and collective intellectual development, then Australia needs Lyssas voice today just as much as it (badly) needed it in the 80’s. 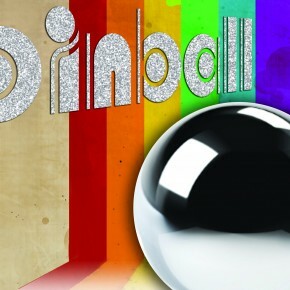 Fortunately for Sydney-siders, director Sarah Vickery, Producer Gavin Roach, stage manager Petra Vaculik and the rest of the Duck Duck Goose company have come together to bring Pinball back to the Australian Stage for the duration of the Sydney Gay and Lesbian Mardi Gras. I can’t urge people to see this play enough, it is artfully and skillfully written, and respectfully and lovingly performed. Vickery clads her cast in late 1970’s garb including bright orange nylon jumpsuits, mesh minis and the irrepressible (why is that?) Bermuda shorts and knee length socks. The cast have a lot of work to do, the script is witty and dancing, and many of the roles overlap, providing exciting additional commentary and double entendres that can be lost without strong performances, but the cast are up to the task with a devotion to their material apparent. Ali Aitken and Leo Domingan hold the candle for two parallel relationships that show the influence an old guard can have over a new generation. The real multitasking challenge is up to John Michael Burdon who provides a fascinating performance as a collective misogyny that hops into different accents, speech styles, physical incarnations and multifarious influences that come together to form one mighty blanketing voice, perverse in its determination and frighteningly, unanimously supported by society. His is a fabulous piece of work, a real stroke of directorial / writerly genius to bundle all the various forms of bigotry a lesbian woman encounters in her day into the one horrifying control freak. Emma Louise as Axis (Theenies girlfriend and patient sufferer of perpetual barbs and slurs) and Faran Martin as Vandelope (this play has some amazing names) are strong, reasoned voices, who bring their own brand of comedy and pleasure to their important roles. In another clever twist, Martin also plays Miriam, a pregnant streight woman who represents the perfect feminine ideal. She transitions skillfully between the roles and adds another clever comic complexity to an already brilliant script. Tossed about through it all is Karoline O’Sullivan who is a very moving and powerful Theenie, her speeches in the courtroom at the end reminding me so much of Rooster Byron’s cry at the end of Jerusalem, that I wondered if Lyssa was part of Butterworth’s reading material in key formative moments. Theenie’s speeches are why we attend Pinball and O’Sullivan rises to the occasion with all the gentle gravity required. Pinball is a great opportunity to see a deeply under appreciated Australian playwright in all her glory. Don’t miss it.